These little icy worlds are important as they help us tell the solar system's history. They can also help us test the idea that there's a yet unseen planet lurking in the outer solar system. Our planetary system as we see it today is not as it formed. When the sun was newborn, it was surrounded by a massive disk of material. Encounters with tiny, growing planets – including some of the worlds we've just discovered – moved the giant planets outward from the sun until they settled into their present locations. The growing planets, on the other hand, went everywhere, scattering both inward and outward. 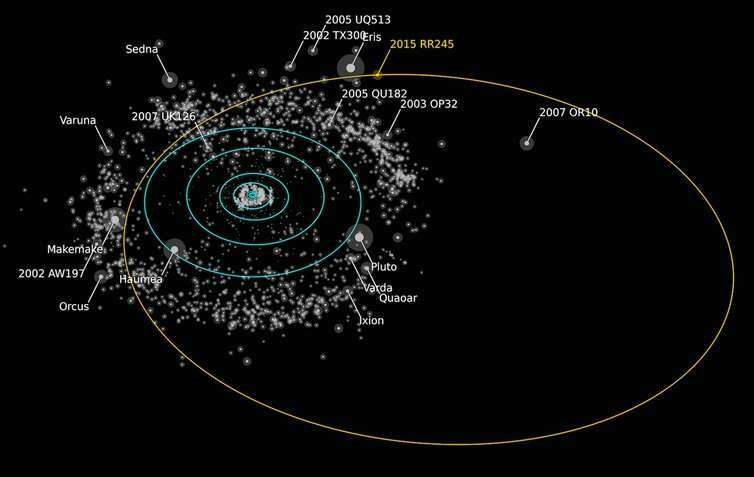 The new discoveries were made as part of a five year project called the Outer Solar System Origins Survey (OSSOS). 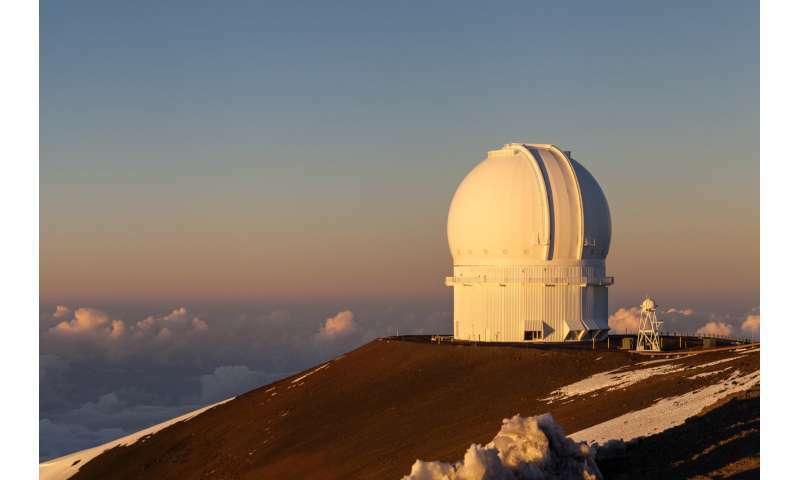 The observations, conducted in 2013-2017, used the imaging camera of one of the world's major telescopes – the Canada-France-Hawaii Telescope on Maunakea in Hawaii. The survey looked for faint, slow-moving points of light within eight big patches of sky near the plane of the planets and away from the dense star fields of the Milky Way. With 840 discoveries made at distances between six and 83 astronomical units (au) – one such unit is the distance between the sun and the Earth – the survey gives us a very good overview of the many sorts of orbits these "trans-Neptunian objects" have. Earlier surveys have suffered from losing some of their distant discoveries – when too few observations occur, the predicted path of a minor planet in the sky will be so uncertain that a telescope can't spot it again, and it is considered "lost". This happens more to objects with highly tilted and elongated orbits, producing a bias in what's currently known about these populations. Our new survey successfully tracked all its distant discoveries. The frequent snapshots we made of the 840 objects over several years meant that each little world's orbit could be determined very precisely. In total, more than 37,000 hand-checked measurements of the hundreds of discoveries precisely pinned down their arcs across the sky. We also created an accompanying software "simulator" (a computer model), which provides a powerful tool for testing the inventory and history of our solar system. This lets theorists test out their models of how the solar system came to be in the shape we see it today, comparing them with our real discoveries. The new icy and rocky objects fall into two main groups. One includes those that reside on roundish orbits in the Kuiper belt, which extends from 37au to approximately 50au from the sun. The other consists of worlds that orbit in a careful dance of avoidance with Neptune as it travels around the sun. These "resonant" trans-Neptunian objects, which include Pluto, were pushed into their current elongated orbits during Neptune's migration outwards. In the Kuiper belt, we found 436 small worlds. Their orbits confirm that a concentrated "kernel" of the population nestles on almost perfectly round, flat orbits at 43 to 45au. These quiet orbits may have been undisturbed since the dawn of the solar system, a leftover fraction of the original disk. Soon, we will see a member of this group up close: the New Horizons spacecraft, which visited Pluto in 2015, will be flying by a world that's about the size of London on New Year's Day 2019. Among the most unusual of the discoveries are nine little worlds on incredibly distant orbits, never coming closer to the sun than Neptune's orbit, and taking as long as 20,000 years to travel around our star. Their existence implies an unseen population of hundreds of thousands of trans-Neptunian objects on similar orbits. How these objects got on their present paths is unclear—some orbit so far out that, even at their closest approach, they are barely tugged by Neptune's gravity. 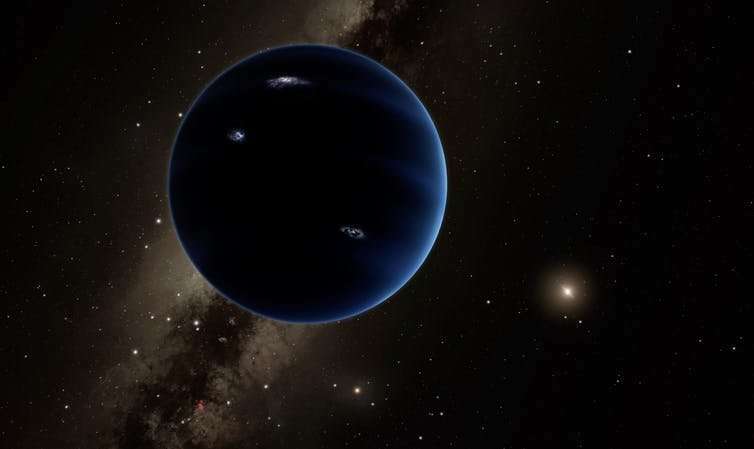 One explanation that has been put forward is that a yet unseen large planet, sometimes called "Planet Nine", could be causing them to cluster in space. However, our nine minor planets all seem to be spread out smoothly, rather than clustering. Perhaps the shepherding of such a large planet is more subtle – or these orbits instead formed in a different way.